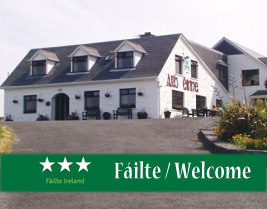 Ard Einne is a 3 star family run Bed & Breakfast for over 30 years. Primarly a family business, we share our local knowledge about the most interesting and breathtaking parts of the island. We welcome guests to our Gealtach island, Inishmore, which is the biggest of the three Aran islands, off the West coast of Galway. a 'true flavour of island life'.